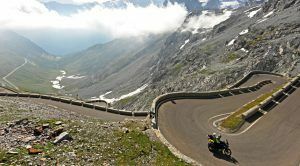 PIY (Pay It Yourself) 7-Day Trip Featuring Famous, Infamous, and Secret Alpine Passes June 6 – June 13, 2019. Beginning and ending in Munich, Germany, we will travel through Germany, Austria, Switzerland, and Italy on a grand adventure through Europe’s finest Alpine Passes. Join Jim Foreman, Laura Ruddy, and locally based riders as they share their intimate knowledge of the region. This is a Pay-It-Yourself trip. That means you save huge money when you purchase your airfare and your motorcycle rental. Enjoy the added benefit of a group rental discount with a booking code. You also pay directly for hotels, meals, and drinks. Savor the benefit of enjoying a ‘non-tour’ trip and having plenty of money to spend on extra days before and after the trip. The price is per motorcycle and is the same whether you are traveling solo or with a partner/passenger. There is a limit of 12 motorcycles. This trip begins in Munich on June 6th. We will return to Munich a week later on June 13th. If you are a previous participant of any Authentic Moto Travels trip, please use coupon code “Euro20” for a 20% Loyalty Discount. The actual costs for this trip are estimated high. -Weeklong Motorcycle Rental (Varies) €825 for a BMW F 750 GS to €1200 for a BMW R 1200 GS Adventure. See Bike-Travel-Service‘s price list. Insurance is included. €500 refundable insurance deductible deposit required. You may also transport your bike to Munich or use a bike from a local source. -Flight (Varies) $700 – $1800 Round Trip. Please ask how to get to Munich from the USA inexpensively. SECRET TIP: Fly roundtrip to Paris from the USA. It’s one of the least expensive international destinations. Then book an (EU) domestic flight from Paris to Munich. Do consider enjoying a couple of days in Paris while you are there. This means that for as little as $3925 total including airfare, you can travel Europe by motorcycle with professional and experienced guides taking you to breathtaking, historic, and wonderous destinations. That’s easily well over $2000 less than the other guys. For a list of Frequently Asked Questions about this trip, please go to the Eurotrip FAQ Page.